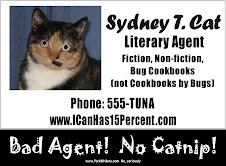 You May Already Be Bad Agent Sydney's Client! All the times, people is asking Sydney if she is taking new clients, and if they can be Sydney's client! All the times! This, even though Sydney has this blog telling writers all the bad things she likes to do! Is good to be me! Purrr! But to these peoples I say, how does you know you is not already Sydney's client? Sydney has found new thing! All Sydney has to do is make some kind of contact with writer. Could be email, or over-the-transom submission, or something handed to Sydney at writer's conference, if she went to writer's conferences, which she never does. Anyway, all Sydney needs is to get hold of manuscript or proposal or pitch, or even just find out about submission writer has already made to publisher. Then all Sydney has to do is keep writer hanging while she secretly sweeps in and takes over property! Sydney can shop to publishers, chase foreign rights, even movie or TV rights, and tell writer nothing! Even easier, if writer has already done much of the work! Good thing is, Sydney has no obligations to "client!" Does not have to return calls, or listen to their silly prattling about how they wants their work handled! No agreements of any kind! Sydney does what Sydney wants! And if Sydney can not sell work, is not stuck with useless writer cluttering up her client list! Far as they is concerned, they was never Sydney's client at all! But if Sydney does sell, then if Sydney does sell, most writers treats Sydney like hero! Every once in while though, some silly writer complains that Sydney has sold property she had no rights to represent! Some silly peoples says it is almost like stealing! The nerves! But, Sydney is just cute little cat (agent)! Everybody forgives Sydney! Sydney does not care if some stupid writers goes away mad. They was never Sydney's client anyway! Bad Agent Wisdom: Sydney is Neither Conflicted Nor Interested! So, this reporter asks if Sydney Agency can possibly to the kind of professional job traditional New York publishers can! SYDNEY IS ALL OVER THIS! 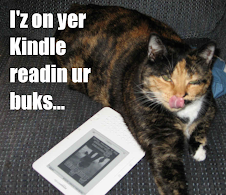 Sydney points out how sloppy and error filled many New York ebooks is! Then Sydney explains to reporter moron how, after takes New York housing prices and cost of living into effect, SYDNEY'S ORPHANS ACTUALLY PAID MORE THAN THEIR EDITORS! PURRR! Sydney knows she made impression on reporter, because they was writing very fast, and kept breaking pencils! Also how their left eye kept twitching! So, yes, Sydney has been in press dissing traditional publishers and saying she can do better job for clients, traditional publishers where many is still expecting Sydney to sell their books! Do not worries, clients! Sydney does not think this will hurt your chances of selling to them! And there is always "ebook pre-printification program" to fall back on.